Rabbi Yekutiel Fish, an expert in Kabbalah (Jewish mysticism) gave a lesson this week in which he discussed how the Messiah was imminent. 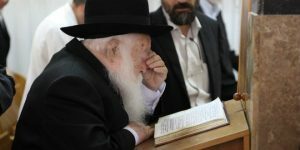 Rabbi Fish cited Rabbi Chaim Kanievsky, one of the most prominent Haredi (ultra-Orthodox) rabbis of this generation, who began foretelling the arrival of the Messiah just a few years ago. “It is written that in the days leading up to the Messiah, tzaddikim (righteous men) will begin to announce his arrival but some people, those who have not prepared for His arrival, will laugh at the righteous and the learned,” Rabbi Fish said, warning that it is forbidden to mock the righteous. Rabbi Fish related a story that is just now being told within Haredi circles in Israel. A young Torah scholar from outside of Israel was hosted for the Sabbath a few weeks ago at the house of a follower of Rabbi Kanievsky. The young man visited Kanievsky during the Sabbath. He asked the rabbi if he should apply for Israeli citizenship in order to vote for the Haredi party in the Israeli elections being held on April 9. Rabbi Fish emphasized the need for Rabbi Kanievsky to make such statements. Rabbi Pinchas Winston, an expert on Jewish sources concerning the Messiah, normally eschews predictions of the Messiah’s arrival based on a precise date but notes that such a statement made by a scholar and righteous Jew of Rabbi Kanievsky’s stature needed to be related to in a different manner. Winston noted that the paradigm for this ability to see the Redemption was implicit in the story of the Exodus from Egypt. Winston noted that many people cannot see the beginnings of the Messiah as they are actually appearing because they have been taught that redemption has never happened. Rabbi Winston applied this concept to modern history. “God can be speaking right at you, saying the Messiah is right in front of you, but if you refuse to hear, you won’t,” Winston explained. Rabbi Fish agreed, emphasizing that prophetic predictions could materialize while going unnoticed. Eight days ago, Rabbi Fish predicted that the blood moon lunar eclipse that passed over the continental U.S. on Sunday would be a significant omen, even more so because it coincided with the Jewish holiday of Tu B’Shevat. In fact, an unprecedented daylight airstrike by the Israeli Air Force against Iranian military targets in southern Syria on Sunday led to an intensification of the conflict. An Iranian General declared that his forces were prepared to “destroy Israel” and the Israeli Intelligence Minister referred to the situation as an “open confrontation” with Iran. “It is true that Rabbi Kanievsky has been saying the Moshiach is imminent for a few years, but that is not really very long when we are speaking about the Messiah,” Rabbi Fish said. “And every time, Rabbi Kanievsky speaks in different terms, describing a different aspect of the process,” he added. Rabbi Fish emphasized that the upcoming Israeli elections are the result of a political divide that may prove to be irreconcilable. 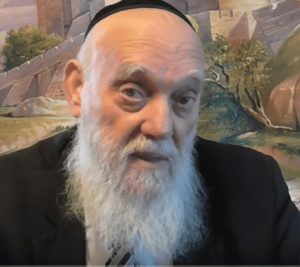 Rabbi Kanievsky’s statement was also discussed by Rabbi Matityahu Glazerson, an expert in Torah codes, in a recent video. Using a Torah program that searches for equidistant letter sequences in the Bible, Rabbi Glazerson did a search for relevant expressions concerning Kanievsky’s announcement. He noted that the term “יבוא משיח” (the Messiah will come) appears once in Leviticus 23 adjacent to the letters “תשעט” signifying the current Hebrew year, 5779. The rabbi also noted that included in the table was the word “מפורים” (from Purim). The holiday of Purim will fall on March 21 this year, three and a half weeks before the Israeli elections. Also included in the table is the word “תשובה” (repentance) and אמונה (belief).